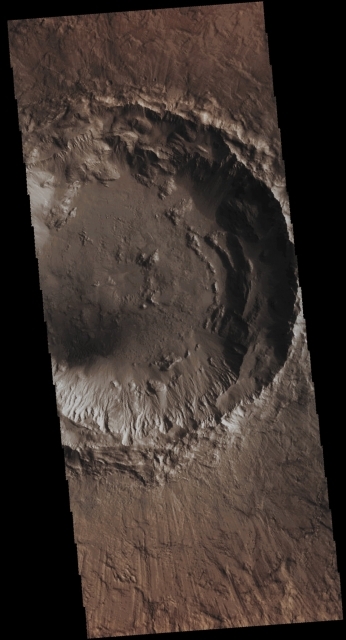 In this absolutely clear and beautiful VIS image, taken by the NASA - Mars Odyssey Orbiter on November, 9h, 2015, and during its 61.676th orbit around the Red Planet, we can - as a matter of fact, truly well - see (almost in its entirety) an Unnamed Impact Crater located in the Martian Region known as Chryse Planitia. If you look carefully, there are several Concentric Ridges visible on the right (Dx) side of the image, and these peculiar Features (should/most likely must have) formed at the time when the impact occurred; in fact, they are part of the (complex) Rim Structure of this Crater. Furthermore, numerous well-defined Gullies dissect the Southern portion of the Rim, a hint of Terracing is visible on its West-facing Side, part of an ancient Pedestal is visible outside its Southern Outer Rim and, last but not least, a small (and extremely dark) Dustfield, possibly made out of Volcanic Ashes (note: we, as IPF, humbly believe that what we can see down there is NOT Sand) can also clearly be seen on the South/Western portion of the Floor of the Crater itself (in between 8 and 9 o'clock). This image (which is an Original Mars Odyssey Orbiter b/w and Map-Projected frame published on the NASA - Planetary Photojournal with the ID n. PIA 20233) has been additionally processed, magnified to aid the visibility of the details, extra-contrast enhanced and sharpened, Gamma corrected and then colorized in Absolute Natural Colors (such as the colors that a normal human eye would actually perceive if someone were onboard the NASA - Mars Odyssey Orbiter and then looked down, towards the Surface of Mars), by using an original technique created - and, in time, dramatically improved - by the Lunar Explorer Italia Team.